Today we come to the Scripture readings, and the beginning of the Service of the Word. This section of the service continues until the Service of Holy Communion begins. Here our soul is fed with the Spiritual meat that it needs in the readings and the sermon. The first liturgy note referred to the “Divine Service.” The idea behind “Divine Service” is that God comes to bless us in worship. This is obviously true of the Scripture readings, but this can be said of all the liturgy which is drawn from Scripture. Take note of the ’98 Hymn Supplement. It does a good job of referencing the Bible passages that the liturgy is drawn from. “The rhythm of our worship is from Him (God) to us, and then from us back to Him.” (LW pg. 6). The entire liturgy follows this pattern. So while it may be obvious that God is speaking to us in the readings, the whole liturgy has already been informed by the Word of God. We speak back to Him what He has first spoken to us. He blesses us and we glorify Him. The Readings along with the Introit and the Collect of the Day, are another proper of the day. Turn to page 10 of “Lutheran Worship” where the propers begin. Note at the top of page 11 there are a list of readings for that Sunday. A pastor may choose a one year series of readings that repeat each year or a three year cycle. The readings for both cycles follow the church year calendar–Advent, Christmas, Epiphany, Lent, Easter, Pentecost. 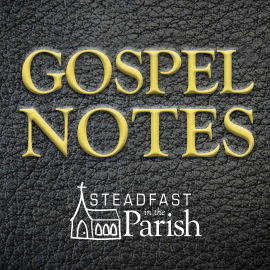 In addition to these readings, the Psalm of the Day and/or the Gradual is typically used in between the Old Testament and the Epistle Readings, and the Alleluia verse for the season may also be used prior to the Gospel reading. Each of these arelisted with the propers for the day as well. More will be said of the calendar later. You will note that often the Old Testament reading corresponds to the Epistle or the Gospel reading in its content. This reminds us that Christianity is not a novel faith but rather it is rooted in the ancient promises of God recorded in the Old Testament. Jesus is thoroughly Jewish in his human family of origin. He has come in fulfillment of Old Testament prophecy. It should be noted that the Gospel reading is treated with a special reverence since it is a record of the very words and deeds of Christ. The congregation stands for this reading, and in some congregations a special procession may be included in which the pastor and/or one or two assistants move to the center of the congregation with the processional cross and a copy of the Lectionary or Bible. The appointed verses are then read in the midst of the people. These traditions serve as visual reminders that the Gospel records are the culmination of the Scriptures. The rest of the New Testament and the entire Old Testament center around who Jesus is and what He did for us as it is recorded in the Gospel records. 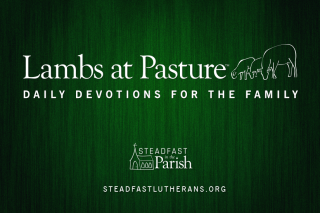 Consider incorporating these readings into your family’s devotional time. Read the texts before the Sunday service so that you might be even more prepared to hear what will be expounded upon in the sermon.